Less than three weeks after the national election, the political opposition has begun to fracture, with the Norodom Ranariddh Party already distancing itself from the Sam Rainsy and Human Rights parties. Previously united with the SRP and HRP in rejecting the results of the National Assembly election, self-exiled NRP President Prince Norodom Ranariddh on Tuesday released a statement saying that his party now recognizes the election results. “The Norodom Ranariddh Party, which participated in the July 27 election, would like to recognize the unofficial result announced by the National Election Committee. 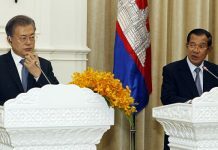 The Norodom Ranariddh Party regards the July 27 election as transparent, free and proceeding according to Cambodia’s democratic way as other international observers have evaluated,” the prince, who is currently in France, wrote. “In an attempt to maintain its integrity, the Norodom Ranariddh Party would like to announce that it would not establish an alliance in any circumstance with the Sam Rainsy Party,” the statement continued. Prince Ranariddh’s statement apparently came as a surprise to at least some senior officials of his own party, as the prince’s cabinet chief Muth Channtha initially claimed Tuesday morning that the statement was a fake. By Tuesday evening, however, NRP Deputy Secretary-General Suth Dina confirmed that the prince’s missive was legitimate, and that it represented the will of the party. “The SRP is working on its projects and they are thinking about their benefits; we must think of ourselves,” Suth Dina said. “The most important thing for the NRP is for the prince to return to the country to lead the party. The election result is a secondary thing,” he added. “So far, some political parties in the alliance promoted themselves too much without thinking about the NRP,” he continued. “The most important thing is the prince’s return,” he reiterated. Suth Dina declined to say whether the NRP was now looking to enter a coalition with the ruling CPP. Prince Ranariddh did not answer repeated telephone calls made on Tuesday to his number in France. SRP President Sam Rainsy and Human Rights Party Secretary-General Ou Chanrath said during a joint press conference Tuesday that they were not concerned about the withdrawal of the NRP from their opposition alliance. 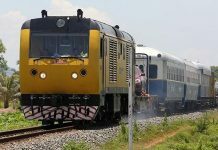 “Norodom Ranariddh is still Norodom Ranariddh; there were many times already that he has joined and then withdrawn-he is tricky,” Ou Chanrath said. “There must be something hidden, he must have received some benefit,” he added. Sam Rainsy said that his party is focusing on the alleged election irregularities and not the NRP’s decision, reiterating his stance that the Assembly cannot convene unless the SRP and HRP’s election complaints are addressed. Sam Rainsy added that he will be traveling to New York this week to bring his election grievances to the UN and will also tour Europe to air his complaints with governments there. On two separate occasions in the past, Prince Ranariddh has lead a party that has joined forces with the SRP following an election, only to ultimately back track and form a coalition with the CPP. Following the 2003 election, the so-called “alliance of democrats” between the SRP and a Prince Ranariddh-led Funcinpec kept the government from forming for over a year in an effort to extract concessions from the CPP. The prince then left the SRP alliance after cutting a deal with the ruling party. The prince was also the strongest advocate for an opposition alliance ahead of the July 27 election. He declined to say, however, whether Prime Minister Hun Sen will now request a pardon for Prince Ranariddh who faces 18 months in jail for a breach of contract conviction. CPP lawmaker Cheam Yeap said that he was unsure whether the NRP could join a coalition with the CPP given the ruling party’s partnership with royalist rival Funcinpec. However, if the prince could resolve his feud with Funcinpec, he would be welcomed back into the country, Cheam Yeap said. 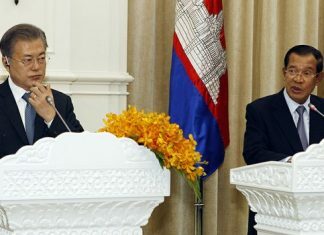 “We want to have a massive Khmer family reunion,” he added.